Dogs get joint pain just like humans do. 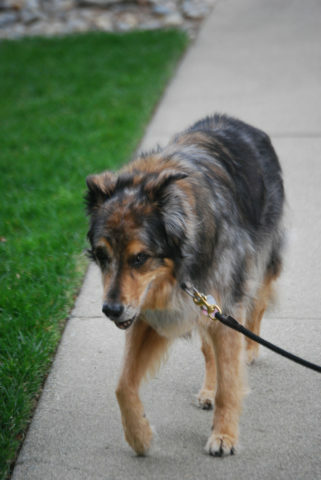 For example, dog arthritis is one of the more common forms of dog joint pain. Here’s the difference between dog arthritis, degenerative joint disease, and inflammatory joint disease in dogs. Regardless of the form of treatment you ultimately choose for your dog’s joint pain, you should initially have your dog looked at by your vet in order to get an accurate diagnosis. There are a number of other things that could be going on which simply resemble joint pain. Typically, dog joint pain is treated with pain medication prescribed by a veterinarian, or a nutritional supplement like Cosequin. As an alternative, you could treat your dog’s joint pain using natural remedies instead. Dog homeopathy is the act of combining a blend of medicinal herbs which present no side effects with dogs. Dog acupuncture can significantly relieve pain in dogs, just as it can in people. By placing teeny tiny pins into various acupuncture points on the dog, pain relief soon follows. Low- impact exercise such as swimming is less stressful on the joints, while at the same time it also strengthens the dog’s joints. Heat applied to the sore spot relaxes the muscles and temporarily reduces a dog’s joint pain. Applying heat also promotes blood circulation for faster healing. Dog massage & stretching helps reduce swelling and promote healing. For example, here’s how to massage your dog’s hips. For added benefit, you can even try a little aromatherapy when giving your dog a massage. In addition, a number of pet owners give their dog supplements for joint pain. Lots of people take those exact same supplements for joint pain (among other things). Here’s some information about giving your dog human supplements. Maybe your dog is just slowing down from old age. In that case, low-impact exercise and dog massage therapy are a couple of natural remedies that will come in handy. As your dog becomes a senior, he will naturally start to slow down and have some aches and pains — just like we do. With a little TLC, you can help your older dog learn to cope and enjoy his golden years.